NMR structure of the bovine β9-thymosin polypeptide based on the PDB 1HJ0 coordinates. The discovery of thymosins in the mid 1960s emerged from investigations of the role of the thymus in development of the vertebrate immune system. Begun by Allan Goldstein in the Laboratory of Abraham White at the Albert Einstein College of Medicine in New York, the work continued at University of Texas Medical Branch in Galveston and at The George Washington University School of Medicine and Health Sciences in Washington D.C. The supposition that the role of the thymus might involve a hormone-like mechanism led to the isolation from thymus tissue of a biologically active preparation. Known as "Thymosin Fraction 5", this was able to restore some aspects of immune function in animals lacking thymus gland. Fraction 5 was found to contain over 40 small peptides (molecular weights ranging from 1000 to 15,000 Da. ), which were named "thymosins" and classified as α, β and γ thymosins on the basis of their behaviour in an electric field. Although found together in Fraction 5, they are now known to be structurally and genetically unrelated. Thymosin β1 was found to be ubiquitin (truncated by two C-terminal glycine residues). When individual thymosins were isolated from Fraction 5 and characterized, they were found to have extremely varied and important biological properties. However they are not truly thymic hormones in that they are not restricted in occurrence to thymus and several are widely distributed throughout many different tissues. Thymosin beta-4 was allegedly used by some players in various Australian football codes and is under investigation by the Australian Sports Anti-Doping Authority for anti-doping violations. ↑ Hannappel, E; Huff, T (2003). "The thymosins. 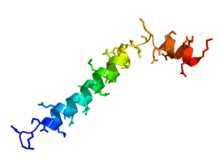 Prothymosin alpha, parathymosin, and beta-thymosins: structure and function.". Vitamins and hormones. 66: 257–96. PMID 12852257. ↑ Low, TL; Goldstein, AL (1984). "Thymosins: structure, function and therapeutic applications.". Thymus. 6 (1-2): 27–42. PMID 6087503. 1 2 Goldstein AL (September 2007). "History of the discovery of the thymosins". Ann. N. Y. Acad. Sci. 1112: 1–13. doi:10.1196/annals.1415.045. PMID 17600284. 1 2 Hannappel E (September 2007). "beta-Thymosins". Ann. N. Y. Acad. Sci. 1112: 21–37. doi:10.1196/annals.1415.018. PMID 17468232. ↑ Garaci E (September 2007). "Thymosin alpha1: a historical overview". Ann. N. Y. Acad. Sci. 1112: 14–20. doi:10.1196/annals.1415.039. PMID 17567941. ↑ Ho, EN; Kwok, WH; Lau, MY; Wong, AS; Wan, TS; Lam, KK; Schiff, PJ; Stewart, BD (23 November 2012). "Doping control analysis of TB-500, a synthetic version of an active region of thymosin β₄, in equine urine and plasma by liquid chromatography-mass spectrometry.". Journal of Chromatography A. 1265: 57–69. doi:10.1016/j.chroma.2012.09.043. PMID 23084823.